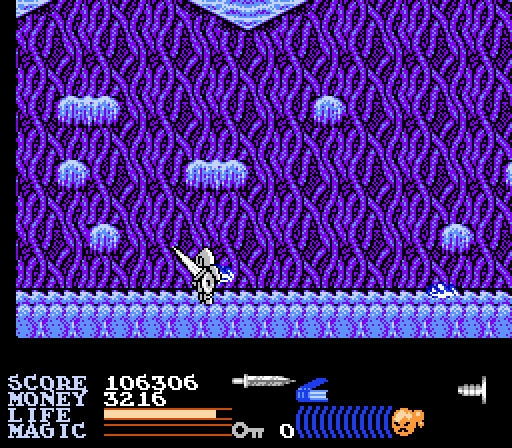 Today I'm going to talk a bit about a fantastic NES game! 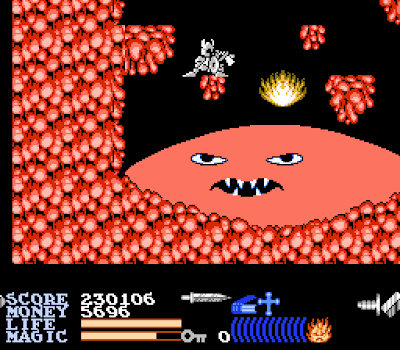 The Wizards & Warriors series has always been fairly popular, but this one gets a lot of attention because of our good friend Fabio up there. There's more to love about this game, though! The map is surprisingly accurate. Back when I was a child, I typically didn't get a new video game unless it was my birthday, Easter, or Christmas. I didn't do any chores, so I didn't have an allowance. I was kind of a spoiled kid, I guess. I didn't have to do anything around the house, just be a kid. For whatever reason, I started saving up my money. I don't even know how I was getting money, but it was probably from birthday cards or something. Eventually I had enough money to buy two NES games, and I chose Double Dragon 2: The Revenge and this little game right here. I don't remember if I had ever played Double Dragon 2 before playing this, but I had played this at a friend's house previously and I thought it was pretty good. 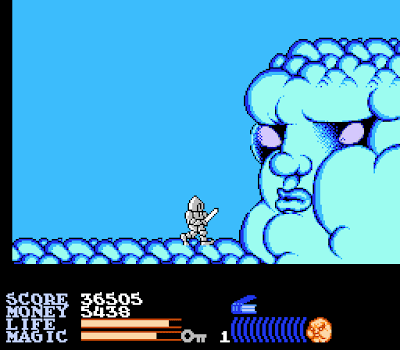 I didn't even know at the time that it was the sequel to Wizards & Warriors, even though it says it is right there on the box and on the title screen. I put it together when I saw the animation of Kuros sliding down a slope. I wasn't very good at it at the time. I guess I'm still not, as I have never been able to beat it. 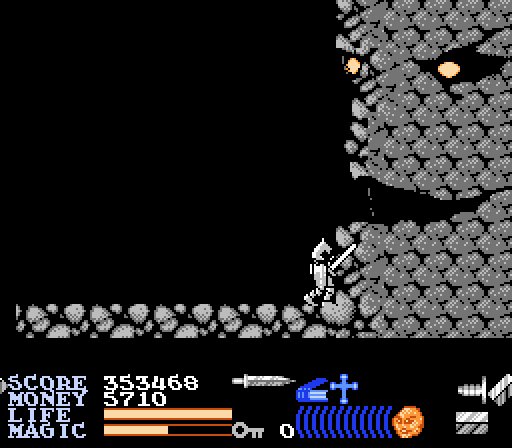 I can make it all the way to the final battle, but I have never been able to successfully defeat the final bosses. 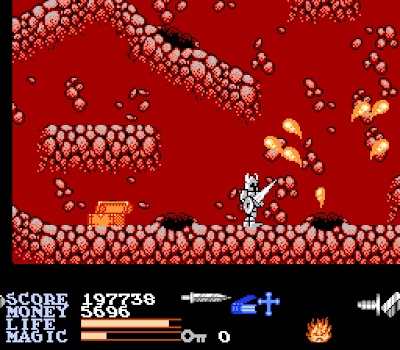 I would play Ironsword before I went to school a lot as a kid, usually making it no further than the volcano stage before I had to get ready to go. 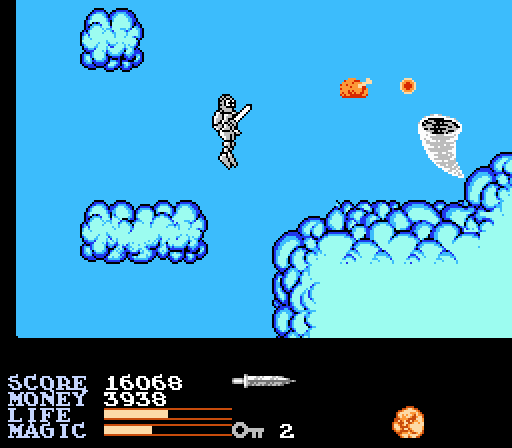 Eventually I started playing it differently and putting Kuros in different pieces of armor and weapons instead of just putting him in the best ones. 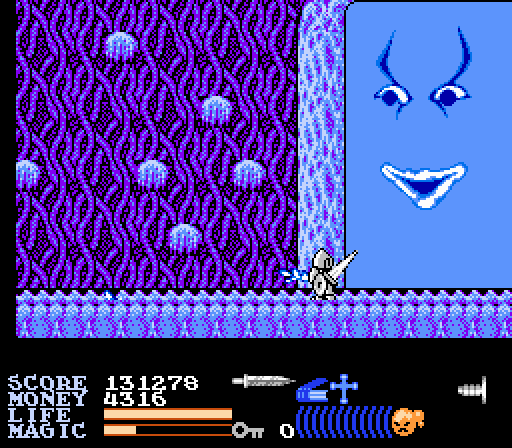 I like games where you change the look of the sprite by changing the equipment, and this is one of those games. 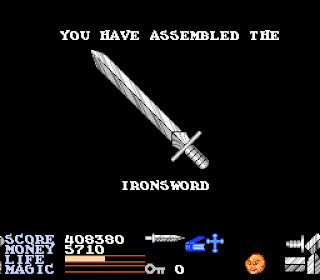 So I had all these passwords late in the game where Kuros has the starting dagger but the diamond helmet and the first shield. It was interesting to me to see how many different combinations I could come up with. One of several large characters you encounter. 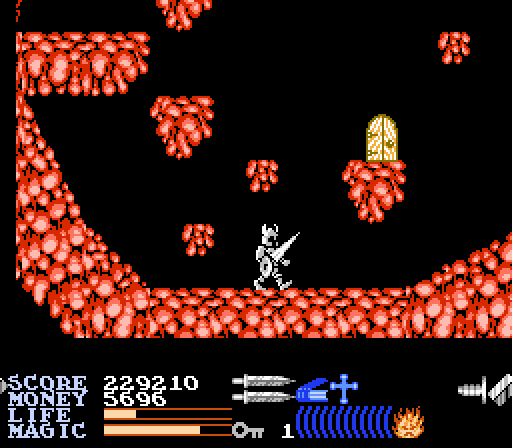 In Ironsword: Wizards & Warriors II, like every other Wizards & Warriors game, you play as the knight Kuros. This time the evil wizard Malkil from the first game has transformed into four different elementals. It's up to Kuros to defeat them and, in doing so, defeat Malkil. 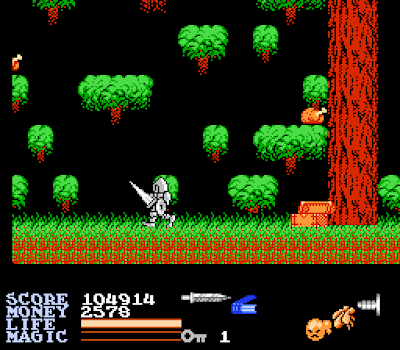 Ironsword was made by Rare and was released on the NES in 1989. It is the second entry in the Wizards & Warriors series, with the first and third games being on the NES and the fourth game being on the Game Boy. This game is quite different from the first game in that each level doesn't feel so by the numbers. 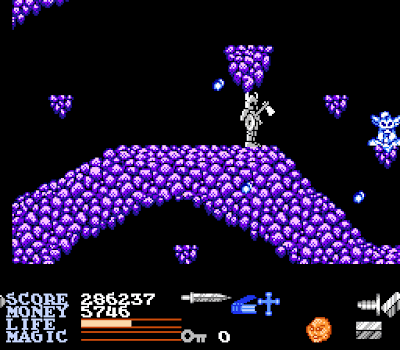 In the original game, you have to collect colored keys and gems to proceed. This time around, you have to find a hidden golden item, locate the elemental attack to defeat the boss, and find enough magic energy to finish the job. You also find a lot of helmets, shields, and weapons along the way. Like other Wizards & Warriors games, you don't necessarily swing your sword to attack enemies. The range of your weapon isn't very long, so the best and intended way to attack is to jump into your enemies. It's kind of a strange way to attack (like bumping into your enemies to defeat them in Hydlide and Ys) but it works well and is quite effective. The base of a mountain. 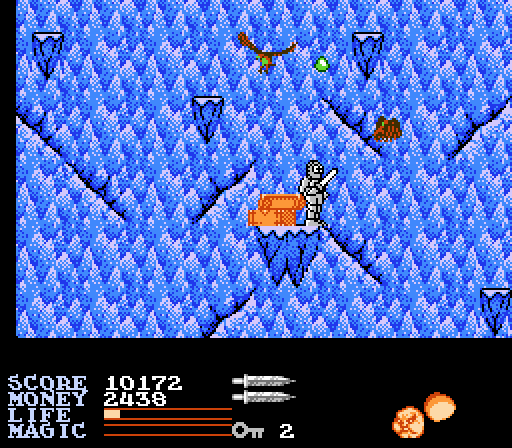 Eagles and slime creatures attack you as you climb to the top. Once you find the golden egg and give it to the eagle, it will fly you up into the clouds where you can bounce around like a trampoline! 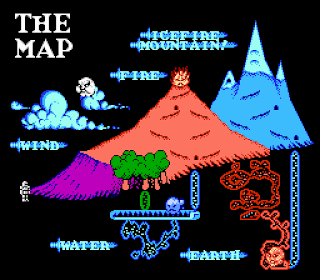 A forest, visually similar to the first stage forest in the original Wizards & Warriors game. 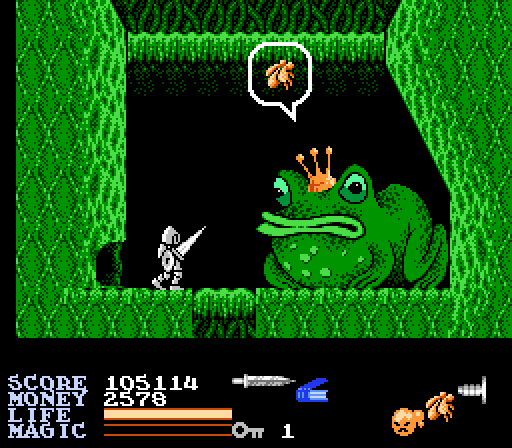 Find the golden fly at the top of the trees and return it to the giant frog to gain access to the underground water area. The current there will sweep you under the water where you can make super long leaps. 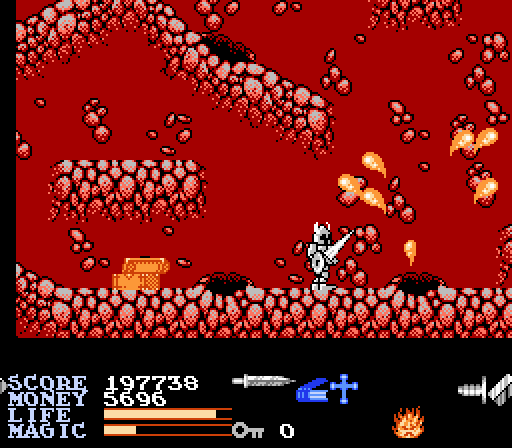 A volcano, which is far more dangerous than the mountain you tackled in the first stage. Lava springs forth from the ground which will burn Kuros even through his armor. Finding the golden crown and returning it to the dragon near the top of the volcano will allow you enter the volcano itself, where even more danger awaits. A cave with many different platforms to jump onto. Find the buried golden tankard and return it to the bear to go even further into the cave. After that, you arrive at IceFire Mountain itself, the final destination for Kuros where the epic battle with Malkil will take place! David Wise, a Rare staple, takes control of the music once again and delivers an amazing and memorable soundtrack! Even my girlfriend who doesn't typically care about game music was jammin' to the music as I was playing through it for this feature. There are several tracks in the game, but there are two that appear more throughout the game than the others. Those two tracks are exceptional and really set the tone for the game. There are, however, a few weaker tracks in the batch like the underwater music. Actually, now that I think about it, all the tracks are strong. Disregard that. Normally I might say something like, "This game is so good! Why is it that no one knows about it?!" but I think a lot of people do know about it. Fabio being on the cover of the game comes up quite a bit when discussing game boxes, so it's not like this one slipped under the radar. I do think that this is easily the best Wizards & Warriors game. Not that I would say any of them are truly bad, but I think this one stands up better on its own than any of the other ones. Ironsword is consistently the most playable of the four games. It doesn't overstay its welcome at all (unlike the third game), the levels are all varied and have a unique feel to them (unlike the first game), and the inclusion of passwords lets you stop whenever you want (unlike all of the other games). Overall, I think this is the best of the best when it comes to Wizards & Warriors. It's not to be missed!